THE DISCLOSURES TRIBUNAL cost taxpayers €87,000 a month in 2017 and this figure is expected to increase significantly next year as the State pays out legal costs for witnesses. Figures provided to TheJournal.ie by the Department of Justice reveal total expenditure on the tribunal, which was established in mid February was €785,905.61 at the end of November. This covered administrative costs of €364,881.23 and legal costs of €421,024.38, which relate only to the tribunals’ own legal team working on the investigation over those nine months. The department said the rates sanctioned are consistent with rates that currently apply under the criminal legal aid scheme. 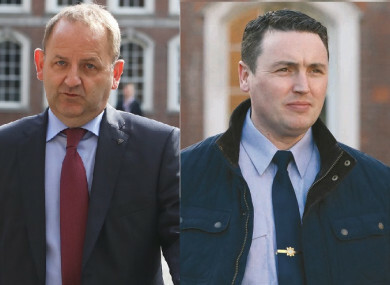 The tribunal, chaired by Judge Peter Charleton, is tasked with discerning whether garda whistleblowers were treated unfairly in the organisation because they reported wrongdoing. At the centre of the probe is whether Sergeant Maurice McCabe was the victim of a smear campaign. Charleton has already completed the module of the tribunal relating to allegations made by Garda Keith Harrisson and his partner Marisa Simms. Harrison had suffered harassment which had been directed by senior management. He and Simms also alleged a social worker from child and family agency Tusla visited their home only after the gardaí put pressure on particular social workers at the independent agency. In his second interim report published at the end of November, Charleton rejected these claims, and found they “simply collapsed” during hearings. The tribunal will recommence hearings after the Christmas break on 8 January. There is one section left and the focus at the start of the year will be on the treatment of Sergeant McCabe before the O’Higgins Commission and the media broadcasts on the leaking of the commission’s report. The tribunal will also hear allegations from former garda press offices David Taylor. Although legal aid has been approved for many of the witnesses in the tribunal, the department said no third-party legal costs have yet been paid. “The level of legal representation for such witnesses will be determined by the tribunal,” it said. The department said Judge Charleton is committed to keeping the tribunal’s costs to a minimum. The tribunal hopes to finish hearings by Easter 2018. Email “The Disclosures Tribunal cost the State €87,000 a month this year”. Feedback on “The Disclosures Tribunal cost the State €87,000 a month this year”.